Dabinett is a classic English cider apple variety, which produces a "bittersweet" juice. It is also one of the most reliable and easy cider varieties to grow. Whilst most ciders are created by blending different varieties, Dabinett can also be used to produce a single-varietal full-bodied medium-dry cider. It is therefore a good choice if you are only planting one or two cider trees. We sometimes have a variant called Black Dabinett, named for its darker red/purple skin colour. This form is either a sport or a seedling of the original. It is slightly more vigorous and ripens a bit later, but the juice qualities are similar to the original. Note that Dabinett apples are not suitable for eating fresh, they can only be used for producing apple juice and cider. Please fill in the details below and we will let you know when Dabinett cider apple trees are back in stock. An old English apple, often used for cider. Dabinett is in flowering group 6. Dabinett is self-fertile and does not need a pollination partner, although fruiting may be improved if there is a compatible tree of a different variety nearby. Like all cider-apple varieties it can also be pollinated by most other apple varieties or crab-apples flowering at the same time. 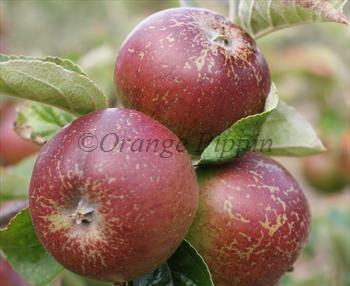 Dabinett is one of the most reliable cider varieties, with above average disease resistance. It is considered self-fertile but it flowers very late in the spring, long after most other varieties have finished flowering. Dabinett is also a precocious variety, with fruit produced from a young age. Dabinett originates from the traditional cider region of Somerset, England in the mid-19th century. It is possibly a seedling of Chisel Jersey.